Hindu weddings are known for its prom and gander. In Hindus there are many cultures with different traditions on the whole. 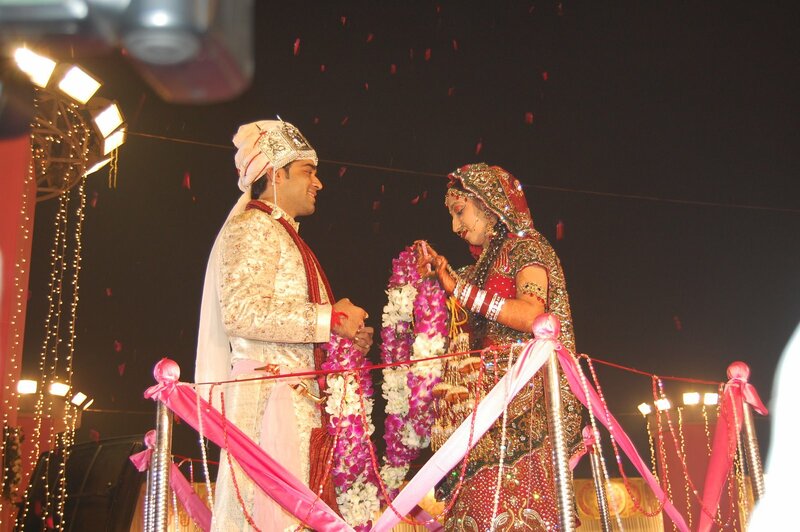 In India wedding is treated as the most special occasion marking the union of two souls for a lifetime. Every customs and rituals in a wedding has its own story and belief behind it thus giving a meaning to the entire process. Hindus do not just pick their wedding date randomly. The astrologers declare a certain time period marked as auspicious to tie the knot. It generally falls around months of January, February, June, July, November and December. 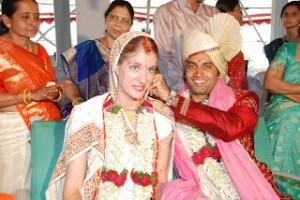 In India marriage is not only about the union of two people but also the two families. Therefore, a bulk lot of the customs involve participation of the family members from both sides. The engagement ceremony sees the families, friends and relatives exchanging gifts from both sides. Most Hindu weddings are more than one week long. It starts with the “Haldi” ceremony, where both the bride and the groom are smeared with turmeric paste separately. This is because turmeric is considered to be a natural agent to glow the skin. Thereafter, both the bride and the groom are forbidden to meet or get out of their house till the wedding day. 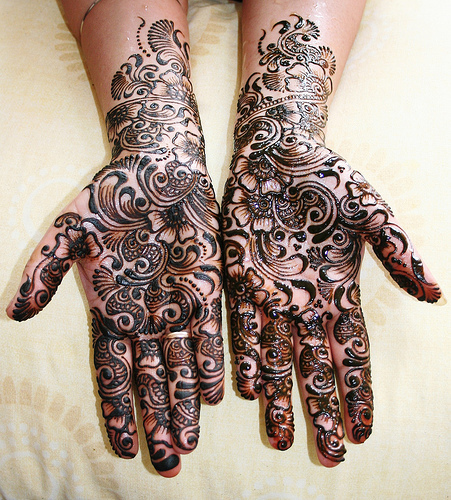 Mehendi ceremony is one of the most lavish ceremonies of all the Hindu ceremonies. Here, the female relatives and friends of the bride gather together and apply henna to the bride hands and feet. The groom’s name is hidden in the beautiful pattern which he has to find out later on. 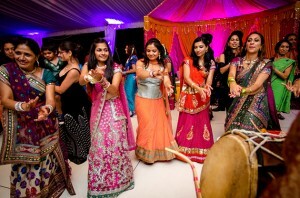 The Mehndi and Sangeet ceremony are mostly conducted on the same day. All the friends and relatives come together and dance and make merry to the tune of traditional songs. Now this is interesting. In India, amongst the Hindus, the groom arrives on the bride’s doorstep, seated on a white horse, as the white beast is considered auspicious. This tradition has been around the Hindu society for a long long time now. However, today, the white horse is replaced by a wedding coach car. But, those who can afford still prefer the symbolic white horse. The journey till the bride’s home is actually a procession with merry making and fanfare, the journey known as the “Baraat”. The groom is surrounded by his friends and relatives who dance all the way till the wedding venue where they are welcomed lavishly with gifts and garlands by the bride’s side. The most important ceremony is the “Saat Pheras”. The bride and the groom walk around the holy fire seven times while each round represents a vow. The couple exchanges their wedding vows in presence of their family. 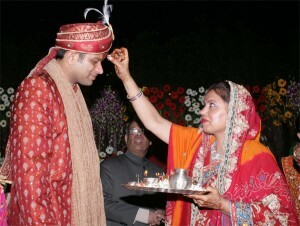 After the vows, the groom fills the bride’s forehead parting with Sindoor- the sign marking a married woman in Hinduism. On the wedding day, sisters of the bride steal the groom’s shoes and the groom has to pay whatever amount of money they ask for in return. The money given is also considered auspicious. A quite playful environment prevails. The morning after the wedding, the bride is given a lavish farewell by the entire family. This ceremony is called “Vidaai”. It is the most emotional part of the wedding. The couple is blessed by the elders as they get ready to leave for he groom’s house. 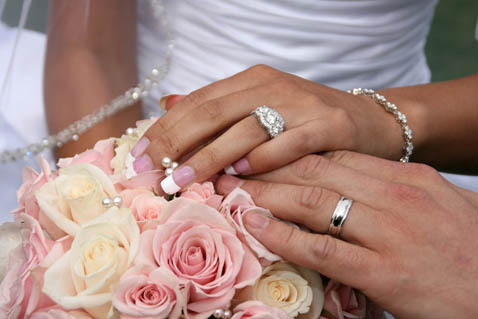 No matter how diversified the human society is, marriage is a common tradition that is followed by all. However, there are many rituals that need to be followed when the couple decides to live their lives together as one. But, there are many peculiar traditions around the world that actually makes you wonder if these people are actually in the correct state of mind. Upon reading these weird wedding traditions, we would love if you share with us any other such traditions you witnessed. Happy posting! Kenya tops the list in the weird wedding tradition. However, it is not all at weird in Kenya to see father of the bride bless his daughter by spitting on her head and breasts. It is done before his daughter leaves for her husband’s house. In Ireland the wedding traditions are weirder. When the bride and groom are dancing the brides feet have to stay on the floor. If not, evil fairies will come and sweep her away! The groom shoots his bride with a blunt bow and arrow before the wedding three times. Then the groom collects all the arrows and breaks them. What this weird wedding tradition symbolizes is that their love will prosper for ever. In Sweden, both the bride and the groom get kissed by people attending their wedding when either of them leaves the table. That is, if the bride leaves the table, then every female in the reception will get a chance to kiss the groom and vice versa. In India, there is a weird wedding tradition to ward off bad spirit. The bride is first married to an animal for good luck and to make her marriage last longer and prosper. These are some of the weird wedding traditions which is religiously followed in some parts of the world. Marriage is a wonderful feeling. And this feeling is further multiplied in India when a guy needs to meet a girl from the perspective of getting married. Of course! It is a difficult task. Therefore it is nest to get thumbs up on what you should not ask a girl. It will be the last thing you would want that a stranger is rolling out in laughter at your questions. Below are a few safe questions to ask a girl to know her better. Note that even the girl is as nervous as you about the meeting. The best approach to start a conversation is to start with general light headed question that will prove to be ice breakers. You may put questions like what her name means, her hobbies, her favorite cuisine etc. Make the environment light. Indian girls are normally very shy. Begin the conversation by talking about yourself and then slowly involving her in it. Girls always feel comfortable to know that her prospective partner is interested in her career. Stop blabbing only about your career, goals and job. Take a break and ask about her future plans. Such gestures always make the girl feel good. Assure her that you are absolutely interested in her future goals, her education and her career. Every girl just loves it if a guy asks her views on marriage and expectations related to it. So, if it is your first meeting, find out time and discuss about her views. Note that this question is important to you as well. It will help you to get a better insight on her thought process. This question might be very huge. But if you could gather the guts to ask about it, you will be able to understand her better. And if she has financial responsibilities towards her parents, you will get a clear idea on her plans in the future. Talk about her social life, her favorite pastime and other interests. You will get an idea if she is an extrovert or an introvert. These details might be small but will help you a lot to understand whether the girl is the girl of your dreams or not. But, hang on! Do not go overboard with too many questions. She might feel awkward. She is the girl you are looking for as a life partner. It is your responsibility to make her feel comfortable. This question is just for filling awkward silence, but sometimes it becomes quite relevant too. If your family is a bit traditional and conservative and the girl is otherwise, you might face problems later on. This does not mean you will nip this meeting in the bud. Keep an open mind as either of you may compromise on things later on. Here are lists of questions that our women readers have tagged luckless and ruinous for first meetings. All the best guys! The tradition of arranged marriages is still quite popular in India, though it is not at all easy to start with. First meetings are mostly about awkward smiles, awkward expressions and awkward silences. These meeting are very tiring and difficult to over come. You get all nervous and are never sure of what to say, what to highlight or what to underplay in your conversations. Sometimes to break down the silence one may ask a lot of inappropriate and irrelevant questions. We have come to your rescue to save you from this trouble. 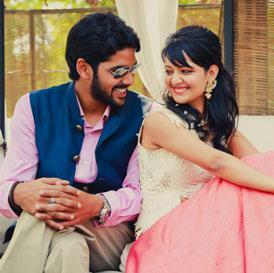 Following are a few questions you should never ask in the first meeting of an arranged marriage. What is your income? Or How much do you earn? “Do not ask a woman her age and the man his salary.” But, today, this tale has come up with a twist. Working women do not appreciate questions about their salaries too. Such questions make you seem like a person who puts money ahead of relationships and you end up making a very poor first impression. Yes! there is no harm into asking this question, but you should know when and how to put it across. Did you have any relationship in the past? Whenever someone ask this question, the probable answer expected in ‘no.’ But at the same time an honest reply is expected too. Whatever it might be, this question is too personal for first meeting and should be reserved for later after things seem to be a little more solid. What is your estimated monthly expenditure? This question is totally vague for the matchmaking process. Inquisitive about financial stability of your match is fine, but asking outright about expenses is not at all. But still, if this question is very important to you, at least rephrase it in the best possible way. You may always through questions about his or her hobbies, likes and dislike. This way you will get an insight of their lifestyle without ponder about their bank statement. How many guy or girls did you reject this far? You do not have to start asking absolutely irrelevant questions just because uncomfortable silences scare you. If a person is opting for arranged marriage, it is quite normal that they met quite a few people before you. Do not act dumb by asking questions like ‘how many people have you met’ or ‘how many guys/girls have you rejected’. You too are in the same coast and have a good chance of getting backfired too. Are your parents financially dependent on you? Do not make the mistake of asking such a question. It servers as an open invitation to be considered a control freak and money minded. This question makes you look financially stringent. Today, it is not just guys, but girls too love to take their parent’s financial responsibility on themselves with willingness in India. How about kids? How many do you want? Do not even consider talking about kids in the first meeting. They are arranged marriage setup and should be strictly limited to making efforts in knowing the person sitting opposite you. Throwing a direct question about how many kids the other person would like to have is absolutely irrelevant on such occasions. Come’ on! It is a sensitive topic and you need to discuss it at the right time in the right manner. What are your views on God? This kind of questions sounds very orthodox. The first meeting is all about understanding the personality of the person sitting in front of you. Asking someone about their belief system will make you sound judgmental and a narrow-minded individual. It wont serve any good even if the question is asked very casually. Can you cook? Will you do it everyday? First of all, get me an answer. Are you looking for a spouse or a cook for your home? You are in an introductory meeting and not in an interview to discuss the household chores he or she can do. If this question is asked to a working person, it is definitely not possible to come back home after work and then cook. Expecting women to do so will be foolish. Remember that when you ask wrong questions, you will only end up making a fool of yourself and losing a good match. Step aside from making any foolish moves. Hope you end up with a wonderful person – the perfect prospective partner. 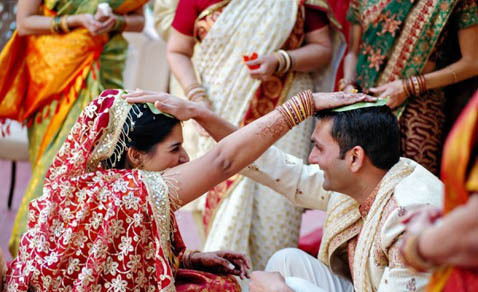 Traditional Indian weddings are a grand affair and involves lavish preparations. The number of people attending a wedding could be anywhere between 500 – 1000. Here, the sanctitude of the ceremony is preserved through numerous traditional rituals and is accompanied by lots of entertainment, fun, colorful dresses, jewelry, lip-smacking foods, music and dance. One can see lots of variations in the Indian wedding traditions according to the cultural community, religion and region. However, most of the basic ceremonies which we are going to discuss in the following sections of the article are more or less the same. 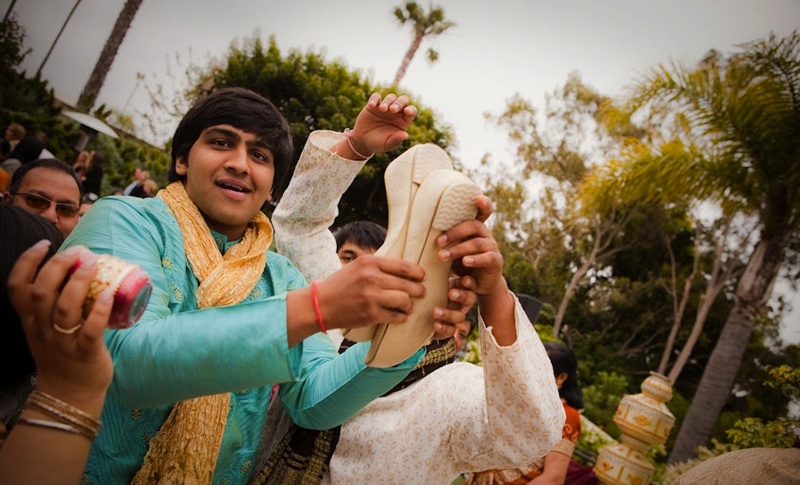 The Indian wedding ceremony is preceded by two major events. One is the engagement ceremony and the other is the ‘Mehendi‘ or ‘Sangeet‘ ceremony. The engagement ceremony takes place on an auspicious date fixed by the elders of the family after consultation with the priest. As compared to the wedding, this is a small affair which is attended mostly by close family members and friends of the girl and the boy. During this ceremony, the couple exchange wedding rings. It is followed by exchange of sweets between them as well as the members of both families. The occasion concludes with music, dance and loads of fun. ‘Mehendi’/’Sangeet’ is another fun-filled event that takes place at the bride’s house just a day before the actual wedding. 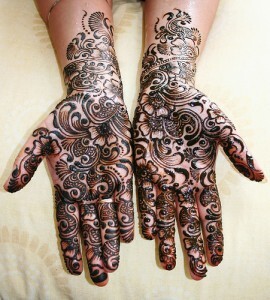 On this day, henna (mehendi) is applied on the bride’s palms and feet with intricate patterns. Other women attending the occasion also get mehendi done on their hands. This occasion is also celebrated with song, dance and merriment. The main ceremony begins with the arrival of the ‘Baraat’ which is a formal procession that includes friends, family members and relatives of the groom . 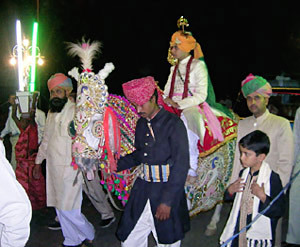 The members who join the Baraat are called the ‘Baraatis’. There is a lot of music, dance and enjoyment in this gathering. When the Baraatis reach the beautifully decorated wedding venue, the bride’s family gives them a warm welcome. 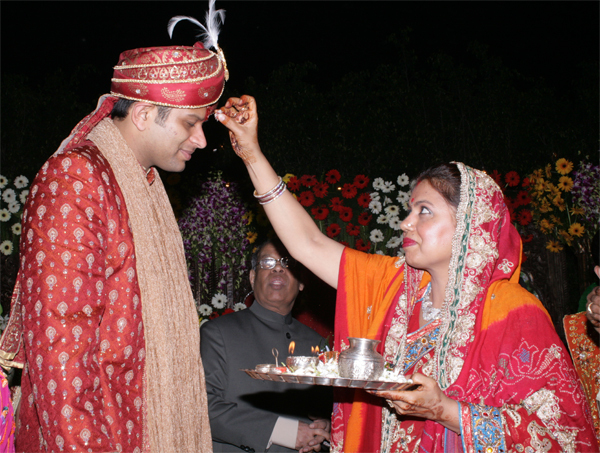 The groom can enter the venue only after the bride’s mother performs a ritual called ‘Aarti‘ by rotating a small holy earthen lamp in front of the groom. Soon after the entry of the groom, the auspicious ‘Jaimala‘ ceremony takes place. 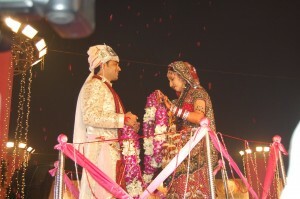 Here, the bride and groom meet each other and exchange garlands. This ceremony signifies that the couple accept one another as spouse and pledge to show mutual respect to each other throughout their life. 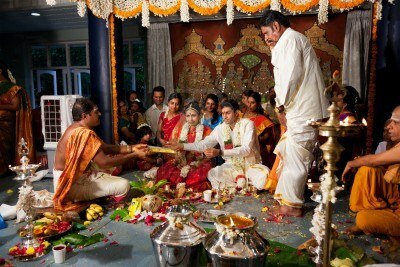 Once this ritual is over, the guests and relatives present the couple with wedding gifts and congratulate them. Then, comes the most important section of the wedding, where the bride and the groom exchange vows in front of God while chanting slokas (hymns) with the priest. 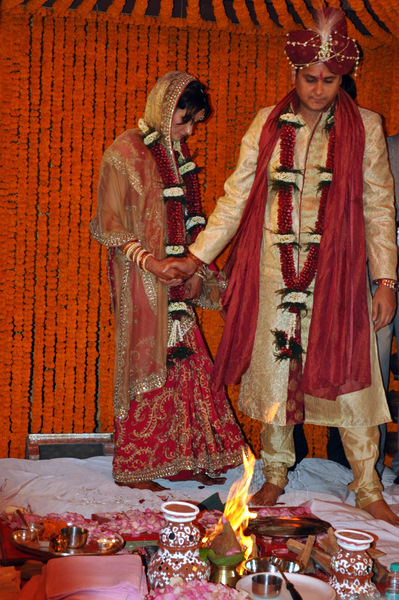 After that, the ‘Phera‘ or ‘saat phere’ ritual takes place where a knot is tied with a part of the bride’s dress and the groom’s dress, and they move around the ceremonial fire for seven times. Each round or phera has its own significance. In the first three rounds, the groom follows the bride which signifies that the bride will take charge in the earlier part of their life and in the next four rounds the groom leads which means he would lead in the later part. In various communities, there is a ritual of putting ‘sindoor’ or vermilion on the bride’s parting of the hair and a gold or silver chain with black beads called ‘mangal sutra‘ around her neck. Most of the married Hindu women are supposed to wear sindoor in their hair parting and mangal sutra for the rest of their married lives. These two are considered as the sacred symbols of marriage by them. The wedding ceremony is followed by a grand feast in which the most sumptuous food is served. The best possible delicacies are prepared for the occasion. The food largely depends upon the region to which the couple belongs to. Like in some communities, only vegetarian foods is served, while in others you will find all types of food. Sweets are an important part of the menu. There are at least 4-5 different varieties of sweets, if not more, served on the occasion. Another interesting feature of the wedding ceremony is the games. ‘Hiding the Shoes’ is the most popular among them. It is a kind of prank played by the bride’s sisters on the groom. Before the start of marriage rituals, as soon as the groom removes his shoes, his sisters-in-law hide them somewhere. Later, they demand money from the groom in exchange for his shoes. Lots of negotiations and bargaining take place between the two parties until they finally reach an agreement. There is a lot of fun and merriment involved in the process of bargaining and everyone enjoys it. Besides, there are also many more interesting games that are being played between the bride and the groom. Friends and relatives of both families sit in the audience to support the bride and the groom. Finally, the time comes for ‘vidaai’ when the bride bids adieu to her parental house with blessings from the elders in the family to start a new life in her husband’s house. 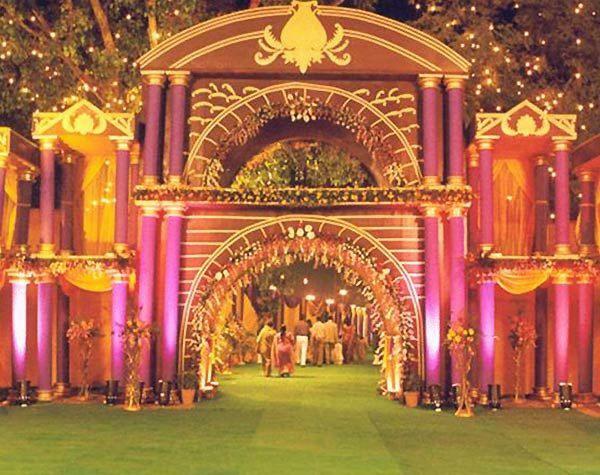 The common feature of all Indian wedding ceremonies is that both the parties take the best possible efforts to make the event a successful one. It is not just a celebration of marriage between two people, rather it is a joyful occasion to celebrate the unification of two families. Indian weddings are a colourful and vibrant mélange of a number of customs and events. If you take into consideration the various different cultures and religions in the country, you will find a variety of pre-weddings functions and celebrations that span over days, apart from the more serious ring exchange ceremony and the exchanging of vows. A couple of the most popular and commonly celebrated functions are the Sangeet and the Mehendi. The Sangeet is one of the more vibrant and fun celebrations in Indian weddings, replete with enthusiastic live music and dance performances and food and drinks galore. 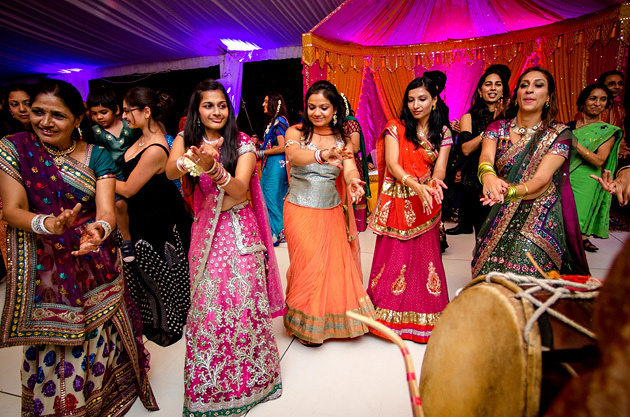 Today, the Sangeet is often celebrated on a grand scale with choreographed dances and skits by family and friends on film and wedding music and sometimes professional performers are hired too. 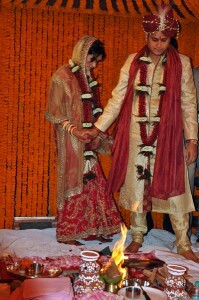 A ceremony common to Hindu and Muslim weddings is the Haldi ceremony. During the Haldi ceremony, the bride is made to sit on a small stool and family members apply a turmeric paste on the bride’s face and body. This fun ceremony usually takes place a day before the wedding and most people add their own spin on it. The paste made with turmeric, sandalwood and rose water is meant to beautify the skin and get the bride ready for her big day. Female family members normally sing traditional Haldi songs. The Roce ceremony is a pre-wedding ritual that is followed by some Christian communities. Also held on the day before the wedding, the bride or groom to be is given a bath with hot water and coconut milk or juice; oil is also applied on the forehead or in the ears. Nowadays family and friends also have a little fun by putting all kinds of weird things like eggs on them. The Roce is then followed by a dinner for all guests present and marks the start of the celebrations to come and signifies the last bath as an unmarried individual.